For the first time since the re-introduction of the Gray Wolf in Idaho, hunters will take part in managing reintroduced Gray Wolf numbers. Reintroduction of wolves is a very controversial topic for all parties. 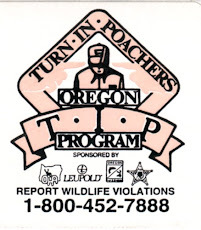 From the big game hunters to the ranchers to the environmentalist. Nothing gets individuals fired up as quickly or passionately as the discussion of wolves and their reintroduction. Personally I have mixed feelings on the subject. I encourage comments on this topic. I'm interested in finding out if there is a middle ground that can be struck. This is a no brainer and everyone loves these. Simple and fun. To start with, cut elk (any cut you like it's all good) into 1" squares approx. Season lightly with garlic powder and pepper. Chop up vegetables: I use red and orange bell peppers, fresh mushrooms, sweet onions, zucchini and cherry tomato's. Make sure you soak your bamboo skewers prior to skewing, this way your meat and veggies will stay skewered through the barbecuing period. Next give all your veggies a light dousing with a good olive oil and begin skewering your goodies, alternating the meat as you like. Get the BBQ hot and place your skewers on the grill and rotate as each side gets browned,usually about 2-3 minutes a side and 10 minutes later you'll be ready to start eating. This is a very versatle recipe so be creative and use your imagination. Get your friends to help you skewer the goodies. Enjoy! When it comes to dressing the part for social settings, I am less than inspired. That's like a duck out of water...ask my friends and they'll concur. I much prefer being in the marsh with face camo paint, wearing chest highs, 3 layers under them, slogging in semi frozen muck, mud and ice. All for a stealthy belly crawl in hopes of knocking down a pair of late season plump Mallards. By the time I get to my destination I have sweat buckets and am now thoroughly soaked. Also known as a "science experiment" wearing chest high neoprene's. I pause for a few minutes to make sure I am where I need to be and also to catch my breath. My Lab is hyper alert and ready to crest the top of the dike.....and have a personal hunt of her own. It has taken us an hour and thirty five minutes in all to get here. We can hear the Mallards making their feeding sounds, moans, purrs and little grunts. It gets me deep down in my belly with excitement and anticipation. I am in awe when I get to be this close and they have no idea I'm there. I savour the moments a bit longer than when I was in my youth. Realizing just how special being right where I am, in this exact moment in time. Unless you've been there it is not easy to explain. It's the moments that feed your soul and tell you that this is where you're most at home...where you belong. Guess I overdressed a bit, didn't need that fleece vest after all. The sky is a cold flat gray with intermittent snow showers. I have 2 ducks in my vest from an earlier sneak and I am starting to think about brunch and a hot cup of coffee. Not to mention getting out of these waders... a bit clammy, yes indeed! I peek over the top of the dike one last time to make sure we are in the right place and the ducks haven't moved to far in either direction. Yep, we're good. O.K. READY, my adrenaline begins to spurt and my pupils dilate as Jet leads us over the top of the dike. There is a split second when the ducks are motionless, realizing they've just been had and yes, I am a predator. All hell breaks loose as there are not just a few ducks, but about twenty or so. Screaming "quacks" and feathers flying and water frothing all give way to a double on Drake Mallards.The silence has been broken. Jet plunges in and retrieves both birds still wanting to retrieve more, looking at me for directions. The ducks circle and I reload. We hunker down in the tall grass on the side of the dike that isn't snow covered in hopes of getting a passing shot or two. Jets coat begins to freeze after swimming in the ditch. She is still twitching with adrenaline and fully charged up, her eyes focused on the small flock. After a few minutes we see the last of those ducks leave our area, so we begin the long walk back to our rig. I give her another hug and tell her what a great dog she is and she starts her happy dog tail tuck and runs circles around me. She's happy too. I can feel the warmth of those drake Mallards against my back through my hunting vest and waders. 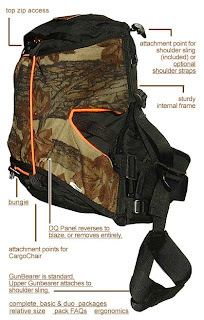 I re-adjust my vest on my shoulders as the weight of it tugs backwards. Walking back to the rig I replay the sneak in my head and feel like "Charlie Brown" (female version) after pitchin' a no hitter! The fact that we got 2 ducks is wonderful, although what strikes me more is having gotten that close to listen to them without them knowing it. Very cool indeed. I forgot about how wet and clammy I was in these waders. Ah, its all coming back to me now...a little squish between the toes. The snow is starting to come down hard out of the north and my tracks out are almost covered completely. The wind begins to pick up and I lower & tilt my head leeward, so as to catch the snow on the brim of my hat and protect my eyes. The temp is dropping and our timing was good. Don't know just how big this storm is....could be a doozy! Be good to get my birds cleaned, have a bite to eat and hunker in for a while. Jet is ready for a hot meal too, and she'll be asleep before the water boils for my coffee. We'll dry out and see what tomorrow brings.....just hope things don't freeze up to much, need a little open water. 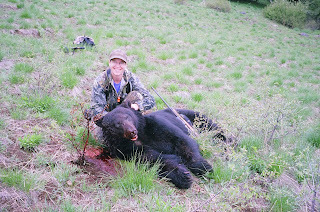 What a fun women's hunt, all be it yours truly and her best friend Jet. I think women hunters can be just as stealthy as than their male counterparts, if not even more so. Do you happen to remember your first duck you shot? Or how about your first deer? You have to remember your first bear! Well I remember my first deer, elk and bear. The duck and other birds are a bit fuzzy in recollecting. 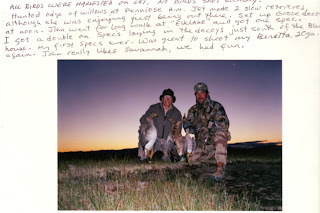 Oh, I do remember my first White Fronted Goose, also known as "Specs". That was just a couple years ago during the opening weekend of waterfowl season. How cool that was! My point of all this is that just because you didn't start hunting as a kid doesn't mean you can't start now. 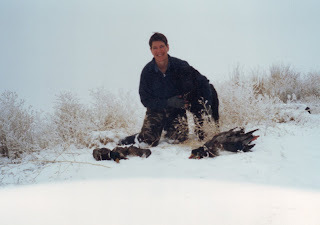 I didn't start big game hunting til my early 40's around 2001. I am having so much fun learning about this type of hunting. I am like a kid at Christmas or probably worse...as in more excited. I am sure that's what my hunting partner John will tell you. He is a pretty even keeled guy with a mischievous glint in his eye. We had a lot of fun hunting Elk last Fall, though we never fired a single shot. Actually not that unusual. Anyhow, if you are the least bit curious about hunting be it birds or mammals it's not to late to learn. I am so thankful to have several wonderful men friends who don't mind showing me how to pursue big game. Not to mention, learning to gut and skin the animals as well as butcher the meat and wrap it in those nice white packages. On the other hand it's been fun teaching a few of them what I know about waterfowl hunting. Well I thought I'd take a few minutes and tell you a bit more about myself and how I spend my time. If you've looked at my Gunning Boxes and read some of my blog than you are beginning to understand my preoccupation with attention to detail and the little things. Having invested a great portion of my life in hand built furniture (which I design) I know something about "those little things". Otherwise why spend the time and energy doing such work? Just as I spend countless hours laying in the field looking at my decoys and trying to figure out how to outwit the real birds. I am asking myself if my "set" looks realistic?...that is to whatever type of waterfowl I am trying to lull in. Maybe there's one, or a few decoys that aren't quite right and that can make all the difference. To some extent this is a judgement call that not will hold true 100% of the time. I look at them(the decoys) from several angles and try to determine if they look "natural" and not to orderly. Often it's best to not mix Canada and Spec decoys, but to keep them in like groupings for optimal results. Just as there are some basic "do's and don'ts" when it comes to woodworking and furniture design. The same is true in setting decoys, be it goose shells, floating geese and the likes for ducks. Not to mention dabblers and divers and their tendencies, and weather too. Learning to make those adjustments with your decoys may be just the trick to getting them cupped and committed. So the next time you see a group of live birds in a field, take some mental pictures of them and put that to use the next time you make your decoy set. We all put alot of time and energy into our hunting(not to mention cost) so why not try to maximize your efforts. Don't be afraid to try something new, you might just be pleasantly surprised! Alright, so I think I have gained my composure enough now to write about a very serious topic. That being one of hiring a taxidermist to preserve your cherished trophy. When it comes to the world of taxidermist, they too have their share of charlatans, those who are wannabes and talk a good talk all the way to the bank with your hard earned money. Leaving you, the customer with a slim chance of reversing the damage which they did to your "one of a kind-once in a lifetime" trophy. Tarnishing forever a cherished memory. So, be warned and do your research. This includes those who are just casual acquaintances, who call themselves taxidermists.We don't go to just any ol' doctor, realtor or drop off the kids at the baby sitter without investigating who these people are and their business history. We want, no we need to know if there is something undesirable in their history. Call your local better business bureau and conduct basic interviews with more than one taxidermist before you hire them. Talk with the president of your own, states taxidermists association and find out who not to go to, and who they recommend in your area. This is imperative, you must do your homework before you have that trophy in your hands. Waiting til you need a taxidermist is inadvisable. Reasons being you are elated with your trophy and the shady "taxidermist" will talk a good line leaving you feeling confident until you go pick up your trophy and then it's to late. I tried this new recipe at the Quail Flats Wild Game Feed this year and it was a big hit. It takes a bit of time to prepare the ducks initially, but well worth it. Begin by preparing your ducks. I use a pair of game shears to cut out the backs, then trim the rib bones out. Next I cut the legs and wings off and set them aside. Leave the skin on the duck breasts. Next is to finely chop the Rosemary and mix it into the Orange Juice concentrate (without diluting). Next in a large 9 x 12 pan spread the duck breasts and then pour the marinade over them. Save a little marinade for the legs and wings. Cover and refrigerate overnight, about 12 hours or so. Turn the duck breasts once while marinading. Get a good hot bed of coals(white) and place the ducks skin side down on the grill and cover quickly so the skin doesn't burn. Leave for approx. 5-7 minutes and turn for about another 5 minutes.The wings and legs are best baked in the oven so they're tender. Place on a cookie sheet and cook for about 30 minutes at 350 degrees. Keep an eye on these as you may need to adjust the time depending on how big or small the legs and wings are. 4-6 depending on size of ducks. I made sandwiches from a few leftover ducks and they were great. I sliced the meat in thin strips and reheated it and it was very good. A friend had given me a loaf of hand made bread which complimented the duck splendidly! Here is where you'll find the recipe for the bread and more fun things! http://www.cristinaacosta.com/.docs/pg/10189. I am looking forward to trying this recipe with Pheasant, I am sure it will be just as good. The marinade didn't overpower the flavor of the ducks, only enhanced them. Enjoy! There is goose hunting and then, there is Goose Hunting! This falls in the latter of the two. The storms had passed and gave way to clear skies and sub zero temperatures. The Klamath River was froze solid and the geese were hungry. Fortunately for us, we had some standing Barley to draw them in. It was in the mid 1980's and gas was a $1.20 a gallon and a dozen eggs only .80 cents. We could get pretty far on both in those years. We hunted hard and put in our time in the pit blind. A 4' by 8' steel box buried below ground level, and yes it was cold! Hunting with my best friend we would smoke Swisher Sweets and tell each stories and watch the smoke billow around us. Playing tic-tac-toe with spent shells on the walls of the pit, waiting for the faintest sounds of Geese off in the distant. We answered them with authority and invited them to our little patch of snow. They answered with urgency and dropped in with reckless abandon...cupped, committed and you'd better be ready! We had geese landing arms distance from our pit blind. We were happier than pigs in ....well, you know. With perma grins and flushed with adrenaline we were warm once again. There was about a week during this particular season when we (about 6 of us) would take turns in the pit shooting limits of geese. Big late season northern Canada Geese. I shot so many I got tired of plucking them. Although when I lay my head on that down pillow (from those very birds), all that remains are the warm memories of good friends and simpler times. Oh, and how I miss both. A couple weeks ago I wrote an article about Waterfowl I.D. After spending time in my shop it's nice for Jet(my Black Lab) and I to get out and do a little birding. There was not much for waterfowl at this location, although the Yellow Headed Blackbirds were everywhere! Beautiful bright lemon yellow heads and loud as ever. They were squabbling over territory's and females and who knows what else. In the background (literally) there were 2 pairs of Ruddy Ducks. The males sporting electric baby blue bills that are absolutely stunning and in such a tight little stiff tailed package. They are amongst the darlings of the waterfowl world. I must say they are better looking than they are to eat. Maybe I just got a bad one, don't know but I am not much interested in trying another. There were also a couple pairs of Canada Geese who had their territory staked out and a few Mallards. Spring has been late in getting to Central Oregon this year and the nesting activity is reflective of such. I look forward to warmer days and more feathered friends returning. So if you get some time, get out to your local wetlands, pond or slough and check out the bird activity. Perhaps you'll add a new species to your life list! Oh, and don't forget your binoculars. Disclaimer: No financial gains were made for this review. This is a wonderful recipe for all types of wild game. It takes a bit of time to prepare the birds although when you are done, you'll be eager to try it on other types of wild game. 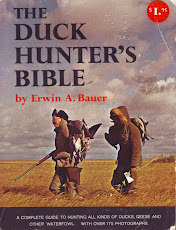 This is an all time favorite amongst our hunting friends. Haven't met anyone yet who didn't want to know the recipe or ask for seconds. I have cooked Pheasant, Quail, Chuckar, Elk, Deer and Bear Parmesan Style and all was delicious. ENJOY! First you need to bone out the Goose and cut the meat into approximately 1" chunks or close to it. Next in a small bowl add 2 eggs, a splash of milk and mix together. In another bowl, mix equal portions of Parmesan Cheese and a good quality Whole Wheat Flour. Using a cast iron skillet (preferred) turn on to medium/low and add a couple Tbs. of butter and a splash of Olive Oil (keeps butter from burning). Place Goose chunks in the wet mix, and then thoroughly coat in the dry mix and then into skillet. Let the Goose get golden brown and continue to cook until all sides are browned. 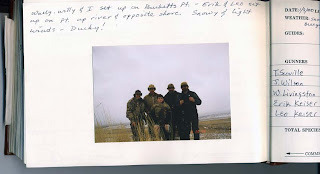 This is not a particularly quick recipe for Waterfowl as there are alot of "nuggets" to cook for several friends. 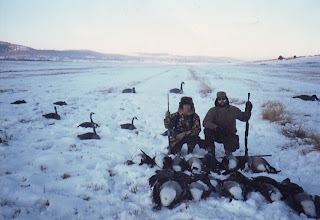 For a large Canada Goose plan on giving yourself about 30-45min. once you have de-boned the meat. This is an event that I have been doing for several years now and a great source of new game recipes. One of the experiences I enjoy about all types of hunting is being able to share wild game with my non hunting friends. I ask my hunting friends to bring a wild game dish of whatever they're inspired to make. My other friends who don't hunt are asked to bring the side dishes, salads and desserts etc. The types of wild meat vary due to the success or lack there of during the previous season. This is quite informative to those who don't hunt. They seem surprised when there aren't any Elk dishes or Venison, let alone Bighorn Sheep etc. Well I tell them it's not as easy as it sounds, being successful each year harvesting Deer , Elk, etc. Sometimes we don't draw a tag and sometimes even when we do draw a tag, we still get outsmarted. After all, it is called hunting for a reason. This year is a fine example. The main dishes will be waterfowl served in a variety of ways and venison thuringer. Types of waterfowl will be Canada Goose cooked Parmesan Style and several species of ducks marinated in rosemary, orange juice and seasonings then barbecued. All harvested from the Klamath Basin in Southern Oregon this past season. The formal recipes will follow in a day or two, so be sure to check back in. There won't be any waders, wet dogs or soggy clothes to dry....just a lot of good food and more stories than you can shake a stick at......second thought, maybe I best keep my waders on hand. Over the years I have spent plenty of time hunting solo with my dog. Those are special days afield. The pace is typically a notch slower and my focus is more on her and the present moment and taking it all in. There is really nothing quite like watching your children grow and learn, be it 2 legged or 4. This past waterfowl season Jet came into her own and I am so proud of her. She has taught me more than my other two Labs I've raised and hunted with. Perhaps a bit of maturation process on my part too. There are some benefits to A-G-E. She taught me to see things from her perspective, that is about 18" off the ground. Life does look different from down there. 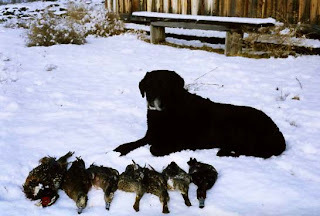 For the first 2 full seasons I was hunter and retriever. Boy I sweated buckets in those neoprene chest highs in October, crossing muddy ditches while she sat on the bank and cheered me on.....or so I thought. Then we continued our travels and every now and then I'd dump a duck out of my vest 'cause I knew we'd be coming back this way. So when we did return I'd get her excited and tell her to "find the bird" and gesture with my hand in the general direction. I was able to see the duck before I sent her so I knew it wasn't a "wild goose chase" yet. After much encouragement she'd find the duck and bring it to me. I would love her up and make a big deal out of it, just to build her confidence. She was pleased with herself as well, running in those puppy circles with such joy. Brought smiles to both our faces. This year was her 6th. in the field and it was special. Her favorite are Pheasants I think because they have so much scent. Anyhow when she is foot tracking them her tail goes left-right-left-right etc and when she is on the hot scent she starts helicoptering her tail. That's my cue to get ready 'cause all hell is gonna break loose any second and I best not let her down. You all know what that look is ...right? Here's a group photo with some of my friends after a morning "diver" hunt on the Klamath River in Southern Oregon. Next comes processing birds while a couple others get brunch underway. Waterfowl hunting can be fast and furious in the Klamath basin in Southern Oregon. Producing wonderful table fare and tired dogs as well as tired hunters.